InfoLit India is a pilot project on Information Literacy (IL) for the new generation learners to make them the effective users of information available in any format. The project aims at developing the essential 21st century literacy skills (Information, Media and Library) in the students of Kendriya Vidyalaya Pattom, Thiruvananthapuram through instruction, training and research. It is conceived on a basic information literacy curriculum which was developed according to the standard skill sets required in an Indian education environment. The project has three main components. The project will select a group of students and carry out a planned Information Literacy programme for the coming one year. This is the first school in India lauching this project on Information Literacy. The logo image communicates, in a simple way, the human skills to search and access information, not only through traditional means, but also with the aid of information and communication technologies, since it uses graphical references that are recognized worldwide, as are the book and the circle. The first one is used to symbolize the study and the second to represent the knowledge and the information that nowadays arrive to us more easily thanks to the Internet, showing also its social role of communication. The logo also represents a book, with its open pages, aside with the circle that integrates a visual metaphor, and that represents all those persons who own the cognitive skills to retrieve the information easily and to gain the knowledge that information provides. Discerning viewers may also see a lowercase “i” which is used internationally for information. 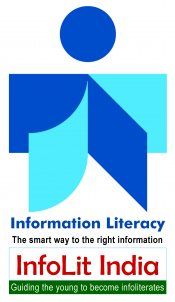 The IInfoLit logo is derived from the UNESCO Information Literacy logo.